Need the perfect function room for your wedding, christening or birthday celebration? Then come and have a look at our new, purpose-built event and restaurant extension. 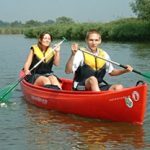 If you live near Beccles, Oulton Broad or in the Waveney Valley and you’re planning a night out with friends, or a celebration with a large group, we can help. We can easily cater for larger dining parties of 8 or more and for private functions of up to 100 people, outside of the holiday season. We also have a stylish and enclosed sunken courtyard garden to relax in. If you’d like us to provide food for your party/function, take a look at our range of buffet options to suit all tastes and budgets, from just £6.50 per head. The extension is part of our continual commitment to improve our customer experience. Our holiday business is growing and the new room helps service the increased demand from people staying on site, plus an increasing number of day visitors who have found what a fantastic place the Waveney Inn is to come and have lunch by the river. Call us on 01502 677599 or email [email protected] to book or for more details.